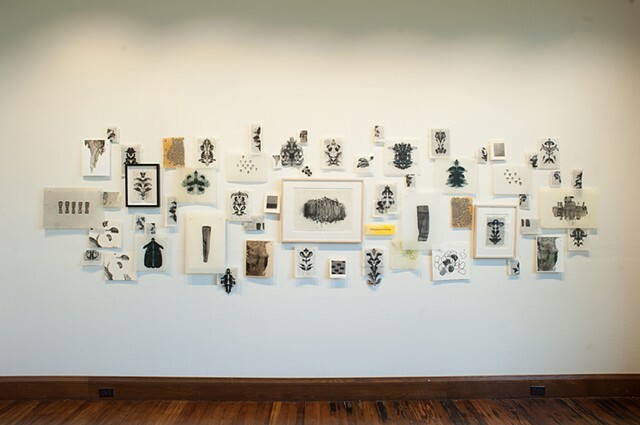 When encountering the paintings and drawings by Cheri Hoffman, one may wonder what they mean. From a distance, they may appear indecipherable. Up close, they begin to shift, reveal, and transform. Each image plays with our experience of vision and how we take in the world, giving us a glimpse into our particular psyches. In many of Hoffmans works, the line between painting and printmaking blurs. For her Rorschach series, chance partially dictates the image, as she first applies dots of paint onto the sheet, which is then folded. Paint then takes shape with whatever tools are nearby, for example, a brush, the blunt side of a palette knife, or a credit card. After unfolding the paper, the new image is revealed. The mirrored forms rendered through this process can be ambiguous and abstract. Other times they are bold and even figurative. Often they conjure ancient forms such as vessels, headdresses, and other ritual objects. In earlier work, Hoffman merged a figurative approach with an abstract aesthetic, all the while investigating different subject matter and techniques. Over the years, she has continued to experiment with what makes an image disrupt and distort, as well as delight. The shifting figures found in Hoffmans Rorschach pieces mirror the impossibility of fixing meaning, leading us to the mystery of our always musing minds.